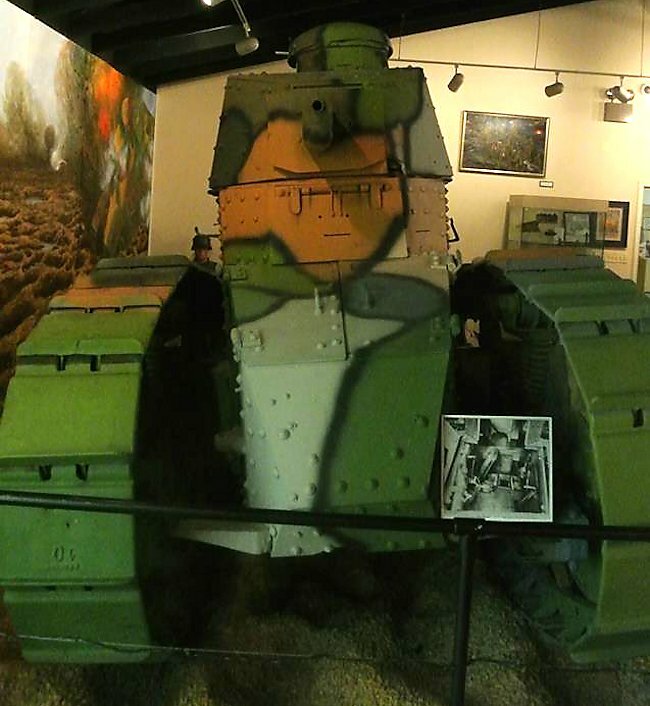 The US Army Tank Corps WW1 Renault FT-17 tank Five of Hearts Fort Meade USA. 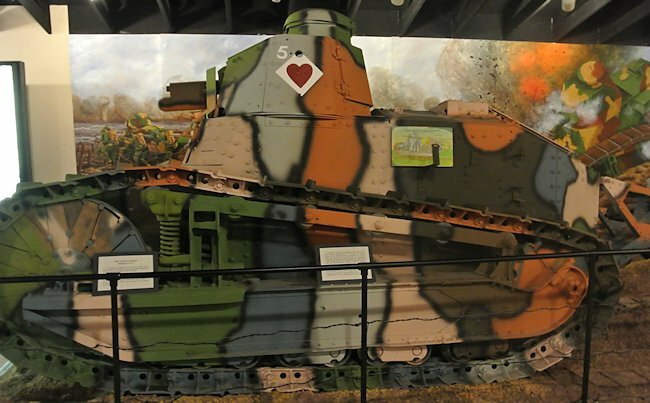 This US Army Tank Corps WW1 French built Renault FT-17 called the 'Five of Hearts' is preserved at the Fort George G. Meade Military Museum, MD USA. The 16th Tank Battalion served with the American Expeditionary Forces in World War One in France. At the End of the war, the unit was assigned to Camp Meade and redesignated the 16th Infantry (Light Tanks). By the late 1920s only two tank battalions, the 16th Light and 17th Heavy (using Mk VIII tanks) and a maintenance company remained of the WW1 Tank Corps. Along with the Tank School, these units were all assigned to Camp Meade. The French built Renault FT-17 tank called the 'Five of Hearts' was given to the American Tank Corps. It was armed with a 37mm main gun. It saw action in the St. Mihiel Salient, The Toul and the Meuse-Argonne Offensives. It was assigned to the 344th Tank Battalion. 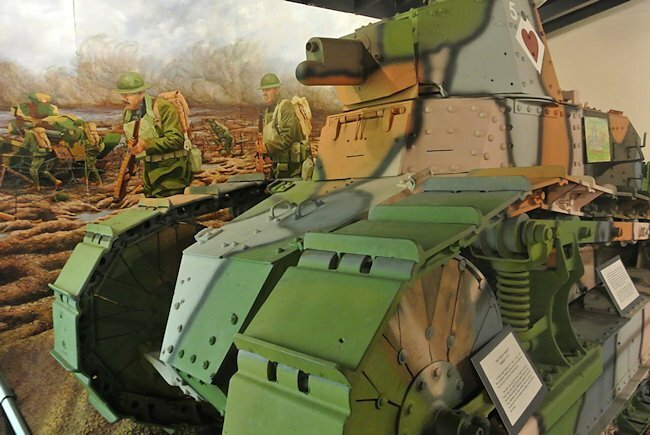 The name derived from the practice of assigning suits of card to different units and the number of the playing card was used to identify the tank. In October 1918, as part of Company C, 344th Tank Battalion, it supported the 16th Infantry in the Fleville sector of the Meuse-Argonne. Overrunning the German lines, this tank was hit over 1300 times, one crew-man was killed and others were injured. Due to the bravery of the crew, a break through in the German lines was established and members of the 16th Infantry were able to take advantage of the opening. In 1919, the 344th Tank Battalion was ordered to return to Camp Meade, MD, USA. They brought the Five of Hearts with as a memorial to all men of the Tank Corps in World War I. The tank has been At Fort Meade since that time, usually in front of the headquarters building or at one of the entrances as a 'gate guard.' 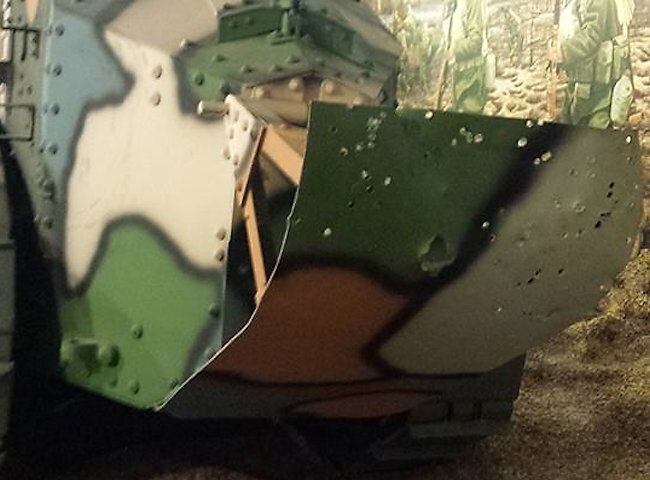 Recently it was restored and taken inside out of the elements and is now an exhibit in the military Museum. The commanding officer my old commanding officer, Colonel Patton, officers and men of the First Battalion 66th Infantry, fellow members of the old Tank Corps, and guests: It is with mixed emotions that I appear before you on this Organization Day and before my old tank, which carried the symbol of the Five of Hearts. I say mixed emotions because my thoughts go back to exciting days, to times of sorrow, to times of joy and humor, to the honor of being here today, and to the future when our tanks may again participate in action. This US Army Tank Corps WW1 Renault FT light tank was armed with a Puteaux SA 18 37mm gun. It was not armed with a machine gun so had to rely on other machine gun tanks or infantry for support in dealing with enemy troops. There were none of us, as far as I know, ever had to be in the A.E.F. Tank Corps that went into action. To the best of my knowledge and belief, all of us were volunteers from other arms of the service, from the different Ambulance Corps serving with allied countries; and Americans who had volunteered their services to the armed forces of our allies prior to our entry into the World War. By and large, Colonel Patton had good personnel material to work with, but it is to his undying credit that he took full advantage of his opportunity and welded together a well-disciplined organization that was composed of the 344th and the 345th Light Tank Battalions. An organization that possessed a remarkably high degree of esprit de corps. I never had the pleasure of serving along with the heavy battalion that made up the brigade, because it trained in England and fought on the British front, but from all accounts and its record I would say that it too was a worthy forbear of the tanks of the United States Army. The driver sat in the front of the Renault FT light tank and the commander stood in the turret behind him. The driver only had a small vision slit to see where he was going. When I replied to the kind invitation for the ceremony of today I asked your adjutant if I was to be called on to make a speech, and if so what did he want me to talk about. I asked these questions because, as you readily know by now that I am a poor speaker, and I wanted as much of "a break" as I could get. Your adjutant's reply was to the effect of telling of my impressions as a World War tanker. Now if I were to tell you of all my impressions as such you would be intensely bored, and furthermore, I am incapable of making such a beautiful concentration of forces. However, if you will be patient with me I will attempt to cite some instances that may prove interesting, and like all war stories, have their pathos and their humor. I will not recite the history of the Five of Hearts on that memorable day of October 4th, because I understand it has been read to the battalion prior to this, and it is on file at your headquarters. I wrote it upon the request of a former commanding officer of your battalion, Colonel Simon Buckner. However, I do not wish to create the impression that I was always in command of the Five of Hearts, whose Serial Number was 1516. 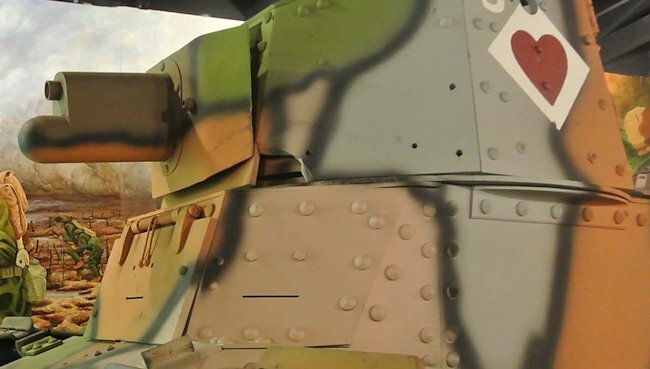 The holes in the back of the Renault FT light tank's 'skid' were caused by German machine gun buttlets. I had nothing to do with his tank until after zero hour on October 4th, 1918. In the' attack in front of Exermont, supporting the 16th Infantry of the 1st Division I 'jumped off' in another tank, and had as a driver an excellent soldier, a Corporal Kelley. We were abreast of our platoon leader, Lieut. Woods. A hedge separated the tanks, and we were to knock out the machine gun nests that were expected to be located in or adjacent to the hedge. I had received orders to keep liaison with Lieut. Woods' tank. It must be remembered that we had no radios in those days. As soon as we passed through the advanced infantry line we encountered hostile machine gun fire. We had not gone far when Lieut. Woods suddenly changed direction toward our own line. This movement might have meant that he had 'spotted' a machine gun position and was endeavoring to take it in the flank. Radio communication would have been most helpful at this time. Corporal Kelley and I changed direction also, and we had not gone far when a German 77-mm. shell exploded right under the right tractor of our tank. 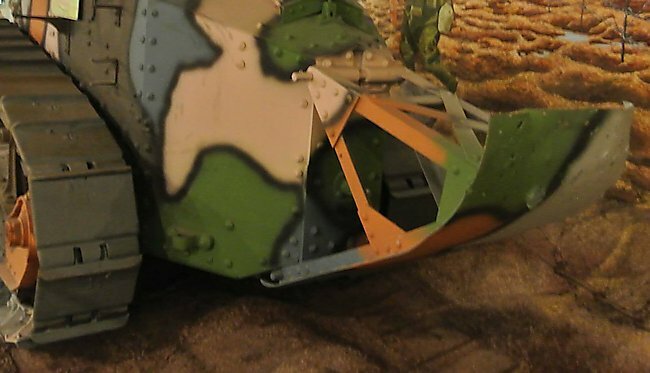 The metal curved 'skid' at the back of the Renault FT light tank was to help it cross trenches. It was unbolted in to gain access to the hole at the back of the tank where a crank handle was inserted. It rocked the tank, and with only one tractor operating it spun around in a crazy fashion. Kelley got it facing our line, and of course he had the 'jump' on me in getting out through the driver's door, but I was right on his heels. You might say that one of my most vivid impressions as a World War tanker is how readily a man can revert back to his prehistoric ancestors in the art of crawling swiftly on all fours when the occasion demands. When we had completed safely our crawling race we found Lieut. Woods, his driver, Corporal Rogers, and their tank, the Five of Hearts. Lieut. Woods had been wounded from the splash of machine gun bullets hitting about the telescopic sight on his 37-mm. and about the vision slits. I took command of the tank and used Rogers as my driver. The machine gun fire from the hedge had been partially silenced, but there was heavy fire coming from the direct front. We proceeded through the mist of the early morning and the smoke of the artillery barrage, and before we knew it we were in close quarters with the biggest machine gun position it has ever been my good fortune or bad fortune to encounter. Time did not permit to count the exact number of guns nor men in that big shell crater, but I judge there were at least three guns and about a dozen men. I saw one than raise a 'potato masher' grenade to throw at us, and I noticed confusion amongst the Germans and some damage, so our fire was having effect. Unfortunately, Rogers suddenly fell forward. I knelt behind him and cautioned him as to the use of the foot throttle, and I steered the old Five of Hearts back to our line. It was a distinct disadvantage of the two-man tank that if one member was knocked out it became necessary to make a replacement. How much the other side was hurt! Rogers had been hit by splinters about his eyes, and the blood from his wounds were blinding him. After getting him to a dressing station I was fortunate in finding a runner from the 345th Battalion who had become lost so I immediately appropriated him as a driver. Back into action we found the big machine gun nest had been taken, and we proceeded to the Exermont River. Here on the opposite bank were some machine gun positions. In trying to spot them I saw a German noncommissioned officer taking cover from tree to tree. He undoubtedly was going from one position to another. His technique was superb! I had no hatred in my heart, but a lot of admiration for that fine soldier as I unsuccessfully tried several times to lay the cross hairs of my sight on him. The old Five of Hearts was now showing the effect of battle her radiator was leaking like a sieve, but there was still work to be done on the other side of the river. We crossed the river and made contact with the enemy as soon as we reached the high ground north of the Exermont Ravine. The outposts rapidly gave way, and those broad packs on the German's backs made excellent targets, but the rough going was not conducive to good marksmanship. Enthusiasm was high, and undoubtedly I followed in pursuit too far ahead of the 16th Infantry. Suddenly we were fired upon at close range. A splinter got my driver in the throat, and as he slumped in his seat the Five of Hearts stalled. I made many efforts to crank the engine from my gunner's compartment, but to no avail. We were caught in a local counterattack. We had no mobility due to engine trouble and our fire power was near to zero because the cradle of our 37mm gun and the turret were both jammed with bullets received at close quarters. There are three impressions that I will never forget about this last action I was in: First, we would have never weathered the storm if we had not come to a very strict understanding. We resolved that under no circumstances would we permit being captured. Having this firmly fixed in our minds, we produced as much fire power as was possible. The second impression is that of beauty. I have seen the long gray line at West Point parade many times, I saw the Victory Parade in Paris, I was in the 1st Division Parade in Washington, and I have seen the Trooping of Colors at St. James for His Majesty's Birthday; but I have never seen, nor do I ever expect to see a more glorious sight than the 16th Infantry as it advanced with their rifles at the high port, and the glint of their bayonets. That was a sight that I can never forget! The third impression has to do with my driver -- the last one I had, the one who saw the most severe action. We met upon the battlefield and there we departed. I have been given to understand that he died of his wound. Maybe he told me his name and because of my having received a head wound I failed to remember it, and maybe on that eventful day we did not bother about such trifles. He was a gallant soldier, and that is the greatest name that he can be remembered by. Permit me to express just one more impression: It is most gratifying and touching for us old tankers to come here to Fort Meade what might be called the home of the American Tank Corps and to see your streets named after our comrades who did not return from France, and to see the fitting memorials that have been erected to them. I am sure that I can speak in behalf of all A.E.F. tankers, both living and dead, in expressing our heartfelt appreciation for the reverent memory of our dead. Thank You.